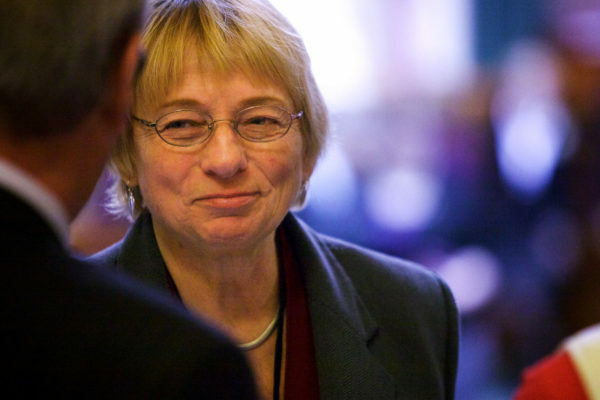 Maine Attorney General Janet Mills is being sued by Gov. Paul LePage for not representing his legal positions. AUGUSTA, Maine — The smoldering legal battle between Attorney General Janet Mills and Gov. Paul LePage is about more than Mills’ refusal to represent the governor in court. The Republican governor’s lawsuit filed Monday against the Democratic attorney general raises questions about an attorney’s ethical responsibility to avoid cases that have no legal merit. Perhaps more importantly for Maine, it’s about the state’s separation of powers when it comes to branches of government. In most states, as well as the federal government, the attorney general is elected by voters or chosen by the chief executive. If he or she doesn’t follow the chief executive’s bidding, he or she can be fired. That’s what happened in late January when Acting U.S. Attorney General Sally Yates refused to defend President Donald Trump’s executive order regarding immigration. In Maine, the attorney general is not part of the executive branch or the judicial branch. Each new Legislature votes to fill the position, which means whichever party has more lawmakers can elect the attorney general. Maine is the only state that uses such a process. Mills became attorney general in 2008 under Democratic majorities but was ousted in 2010 when Republicans won majorities in the House and Senate. She returned to office when Democrats regained control of both chambers in 2012. During the past two legislatures, Republicans have controlled the Senate while Democrats run the House. But an overall Democratic majority has propelled Mills to re-election in secret balloting on the day new lawmakers are sworn in. LePage has long called for the selection process — which is embedded in the Maine Constitution — to change. In 2015, he proposed a bill to have future governors appoint the attorney general, subject to confirmation in the Senate, but House members of both parties opposed the idea and the bill failed in a 115-32 vote. Mills appeared later Tuesday on the same radio station. She said the Maine Constitution and decisions by the Maine Supreme Judicial Court uphold every decision she has made with regards to representing the LePage administration. Mills said she has never denied allowing LePage to hire outside counsel, such as she did in 2014 when LePage’s administration sued the federal government over the right to remove 19- and 20-year-old single adults from MaineCare, which is Maine’s Medicaid program. The state paid about $108,000 to a private law firm that represented LePage in that suit and the subsequent appeal to the U.S. Supreme Court. However, in another suit by the LePage administration over the state’s ability to set rules for locally administered General Assistance for certain immigrants, the administration prevailed. Mills refused to represent the state and LePage spent about $100,000 with the same law firm. The administration essentially won the case — the court said the state does not have to reimburse for General Assistance but also cannot penalize municipalities for providing it. LePage spokeswoman Adrienne Bennett said at the time that it saved taxpayers more than $1 million. LePage makes the same argument as Mills does regarding wasting taxpayer money on private legal counsel when the attorney general’s office won’t involve itself. He said it has amounted to “hundreds of thousands of dollars” and that his contingency accounts should be used for emergencies, not to pay for legal representation as often as it has been. LePage spokesman Peter Steele on Tuesday morning declined to answer questions about the governor’s claim or to provide specifics about the amount of contingency fund money used. “Now that it is active litigation, we really can’t comment,” wrote Steele in an email. LePage has asked the Legislature to approve funding for the executive branch to hire lawyers on at least three occasions — including a total of $1.6 million in 2013 and $2 million in 2015 — but has been denied every time. LePage said on the radio Tuesday that he has made another request for funding in his current biennial budget proposal. Mills said her office is also short on resources and has approximately 7,000 cases and legal representation issues going on at any one time. This isn’t the first time the state’s hiring of private lawyers has been a political issue. In 1973, according to articles provided by the Maine Law and Reference Library, then-Attorney General Jon A. Lund objected to what he called the illegal use of private attorneys by state agencies. In 1989, then-Attorney General James Tierney and Republican Gov. John McKernan went to the Maine Supreme Judicial Court in a suit in which Tierney challenged a Maine Bureau of Insurance decision to allow a large health insurance premium increase by a private insurance company. A superior court judge ruled that Tierney had to represent the bureau of insurance but the supreme court overturned the ruling. Bam, the law school professor, said aside from constitutional issues, Mills and other attorneys have ethical concerns. LePage said on the radio that Maine’s constitutional officers should not be partisan decisions.